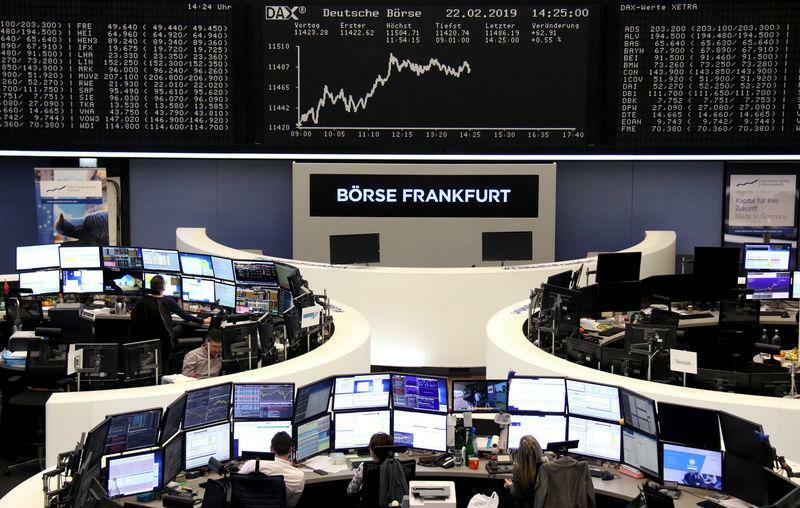 LONDON (Reuters) - U.S. President Donald Trump's decision to delay an increase in tariffs on Chinese goods drove European shares to their highest since October with carmakers, most sensitive to the threat of a global trade war, leading the rally. The pan-European STOXX 600 closed up 0.3 percent and Germany's trade-sensitive DAX rose 0.4 percent. Italy's FTSE MIB outperformed the market, climbing 0.9 percent as government bonds jumped after Fitch affirmed the country's BBB credit rating. Trump said on Sunday he would delay the March 1 deadline for a tariff increase after "productive" trade talks and that he and Chinese President Xi Jinping would meet to seal an agreement if progress continued. Auto shares jumped 2.1 percent to their highest since early November as the tariff reprieve triggered relief for companies most at risk from slower global trade. Car-parts makers Hella, Faurecia and Valeo were the top performers, up 3.2 to 4.3 percent. Some investors remained cautious, though. "I believe the easiest part is done," said Stephane Dutu, fundamental analyst at Unigestion in Geneva. "I believe Mr Trump has oversold the positive aspects of the discussions ... the overall deal will be less impressive than what the Chinese and especially Mr Trump are saying about it." Disappointing results drove some significant declines. Shares in Bank of Ireland dropped 3.1 percent after it cut its outlook for 2019 and reported a weaker fourth-quarter net interest margin (NIM). "A weaker Q4 NIM and a lower outlook for 2019 weigh on near-term forecasts, while guided regulatory capital consumption is higher than anticipated," wrote Davy Research analysts. Covestro shares fell 3.2 percent after the German chemicals group said its 2019 core earnings may fall as low as half of last year's level. M&A was also a driver: French healthcare company Ipsen fell 6.5 percent after agreeing to buy U.S. peer Clementia Pharmaceuticals in a deal worth up to $1.31 billion. PostNL surged 8.9 percent, set for its best day in more than two years, after saying it planned to buy its main rival Sandd for an estimated 130 million euros. Chipmaker AMS climbed 5.2 percent to the top of the STOXX after it introduced a new component for mobile 3D sensing applications.